Tapestry needle to weave in your ends. My scarf measures 7.5 inches wide by 36 inches long. This stitch pattern uses multiples of 8 + 2. 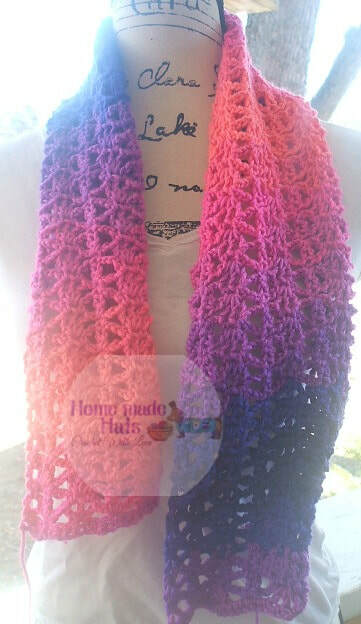 Add this pattern to your Ravelry Favs and Queue here!! Finishing Row: sc in 1st dc, sc in next ch 1 sp, *2 sc in next ch 2 sp, sc in next sc, 2 sc in next ch 2 sp, sc in next dc, sc in next ch 1 sp, sc in next dc, sc in next ch 1 sp, sc in next dc, repeat from * across, ending with sc in last dc, sc in turning ch sp.